More than 190 California manufacturers and career technical institutions opened their doors on Friday, October 6th to celebrate the National Association of Manufacturers’ sixth annual Manufacturing Day (MFG Day). 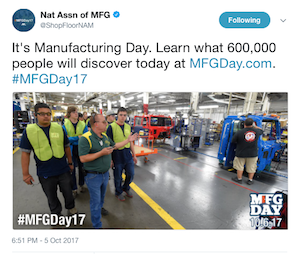 The day was such a success that the #MFGday17 hashtag trended all day long on Twitter's top ten. The celebration is designed to show that 21st century manufacturing is a high-skilled, sleek and technology-driven industry that offers high-wage jobs that fuel the economy. Manufacturers are major employers, property owners and taxpayers, bolstering all aspects of the communities in which they are located – economic growth, charitable giving, quality of life, educational development and overall public health. You can see all the California events HERE. Link to articles on both Champion companies HERE. Manufacturers face many roadblocks, but most say the lack of a skilled workforce is their largest hurdle. A recent report from the Manufacturing Institute and Deloitte shows that over the next decade, nearly three and a half million manufacturing jobs likely need to be filled and the skills gap is expected to result in 2 million of those jobs going unfilled. More than 10,000 new machinists alone will be needed in California, according to a recent report by California’s Labor Market Information Department. That report indicates that there will be tens of thousands of new job openings among hundreds of specific manufacturing occupations over the next seven years. A talent shortage threatens manufacturers’ ability to innovate, create jobs and compete in the global marketplace. For that reason MFG Day is growing every year. If you filmed an event and would like CMTA to include a portion of it in our 2017 MFG Day video montage, please send to Teresa Kent at tkent@cmta.net. MAKE SURE YOU OPEN YOUR FACILITIES FOR "MFGDay" ON OCTOBER 6, 2017 so California can reach 200 events this year. YOU CAN REGISTER AN EVENT HERE. Check out the more than 30 MFG videos you can use to engage your audience, co-workers, and colleagues as we near the target date. If you’re curious about your options for hosting an event or how you can make MFG DAY work for your company, Go HERE. Update: MFG Day up to 94 CA events now! 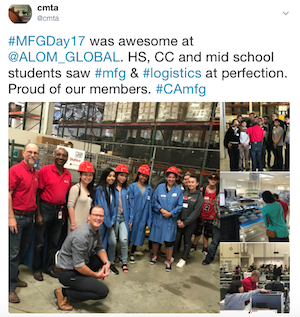 MAKE SURE YOU OPEN YOUR FACILITIES FOR "MFGDay" ON OCTOBER 6, 2017 so California can eclipse last year's 180 total. REGISTER AN EVENT HERE. If you’re curious about what your options are for hosting an event, how to get people to your event, or how you can make MFG DAY work for your company, Go HERE. If you’ve visited mfgday.com lately, you may have noticed that the National Association of Manufacturers (NAM) has taken charge of Manufacturing Day, giving it a renewed energy and focus as the national celebration heads into its sixth year. OPEN YOUR FACILITIES FOR "MFGDay" ON OCTOBER 6, 2017. REGISTER AN EVENT HERE. Manufacturing in the United States faces all sorts of roadblocks, but many manufacturers say the lack of a skilled workforce is their largest hurdle. A recent report from the Manufacturing Institute and Deloitte shows that over the next decade, nearly three and a half million manufacturing jobs likely need to be filled and the skills gap is expected to result in 2 million of those jobs going unfilled. Manufacturing is not just critical to the U.S. and California economy -- it is also a way of life and an integral component of our national identity. This talent shortage threatens manufacturers’ ability to innovate, create jobs and compete in the global marketplace. That is why CMTA is supporting the sixth annual Manufacturing Day on Friday, October 6, 2017. Manufacturing Day is a national event where manufacturers in the U.S. open their doors to show that 21st century manufacturing is a high-skilled, sleek, technology-driven industry that offers good-paying jobs and fuels the economy. Manufacturing Day is the perfect time to draw attention to the outstanding opportunities that a manufacturing career can provide and give future talent firsthand experience with the real world of manufacturing. Last year, more than 2,800 events were held in all 50 states. CMTA was proud that California manufacturers hosted more than 180 of those events, eclipsing our 2015 number of 120. CMTA participated by attending events and honoring our 2016 Champions Betts Spring, and this year we intend to announce another Manufacturing Champion, maybe two! We want to increase the number of hosted events this year to continue the day's incredible success and growth. Currently Califonia has 65 companies and institutions registered to host 67 MFGDay events. We will update our readers regularly on the newest companies to register to host events leading up to October 6. Renewed energy for MFG Day 2017 - Participate on Oct. 6! To familiarize potential Hosts with MFG DAY, NAM is hosting two upcoming webinars. If you’re curious about what your options are for hosting an event, how to get people to your event, or how you can make MFG DAY work for your company, these webinars are great opportunities to learn from past successes and to ask questions. And if you can’t make it to any of these live webinars, don’t worry — we’ll record them and share the best session after they wrap.